If you type this in google map, this address won’t point you to the exact location of Soi Polo Fried Chicken. I will elaborate on the exact location and directions at the end of the post. 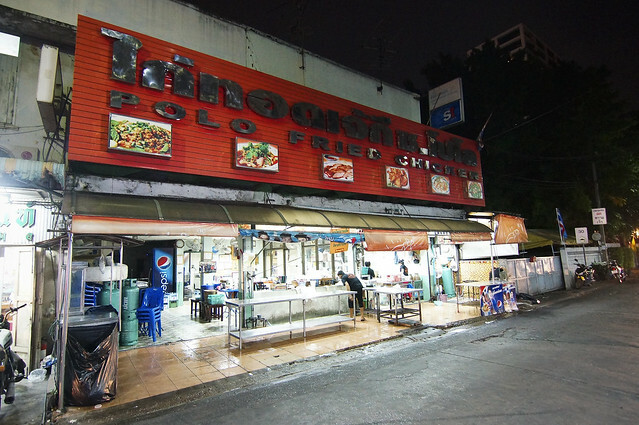 Some of the online reviews say that Soi Polo Fried Chicken offers the “best fried chicken in bangkok”. The funny thing is I will be writing another post on this fried chicken from Siam Square and that too is “the best fried chicken in Bangkok”. 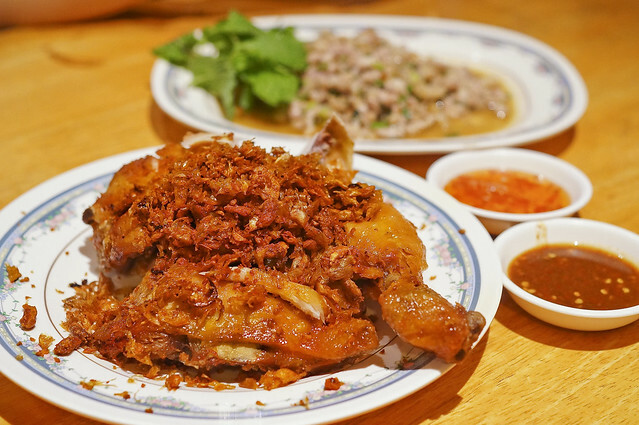 So which exactly is the best fried chicken in Bangkok? I would say these two versions of fried chicken is entirely different and i will explain why in my later post. 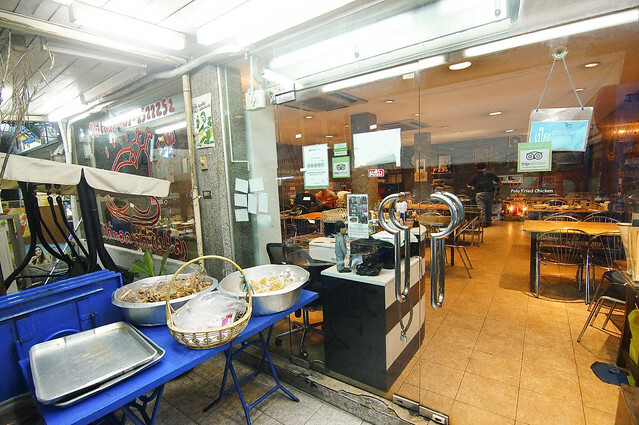 Unlike the SabX2 Wanton Noodle, this place is not much mentioned in Singapore’s blog or site. I gave this place a miss for my last two Bangkok visits so i made it a point to try it out when i can afford the time, and i am glad that i did! The air-conditioned dining area is behind the Pepsi banner so don’t miss it. The Kitchen area is slightly further up. You can see the shop with a red signage at the most right hand of this photo and that is the Kitchen area. Soi Polo Fried Chicken comes in two portion sizes, half chicken for 100 baht or whole chicken for 200 baht. Their version is not the flour breaded deep-fried style but more of a hotel banquet kind of roasted chicken. The chicken itself is rather decent. It’s tender and not too dry. The one thing that makes this chicken really unique is their fried condiment that was scattered generously over the chicken. For sure I can taste salt, pepper, fried garlic and onion and i have never tasted such fried chicken like Soi Polo’s. Scoop a spoonful of the condiment and eat it with the chicken for maximum Soi Polo Fried Chicken effect! For those who love garlic and onion, you will be a fan of Soi Polo Chicken. I just can’t get enough of the fried condiments. 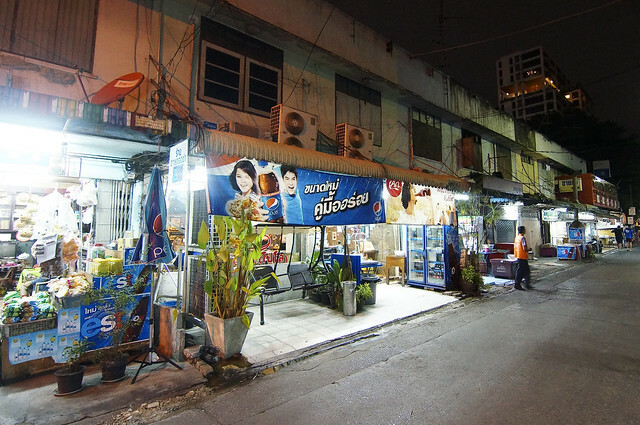 Probably i will return to this place for their Fried Chicken when i visit Bangkok again! Instead of only ordering the chicken, we also tried two other dishes. 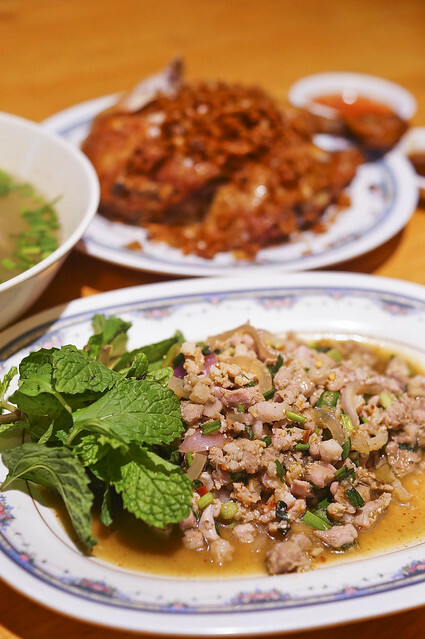 Their Moo Larb tasted quite OK but i feel that there’s nothing special about this dish. 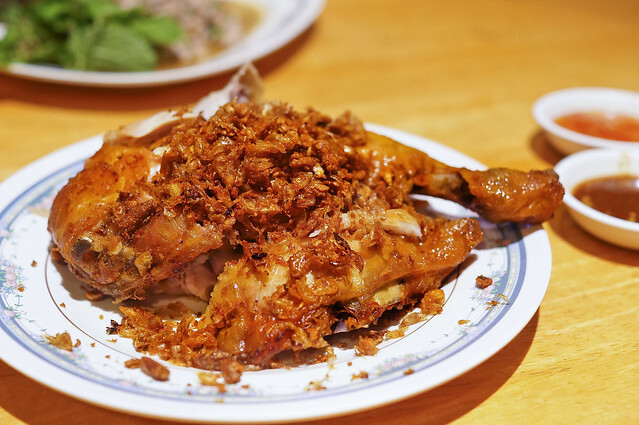 If you only have stomach for one, then make it the Soi Polo Fried Chicken. Note that this Moo Larb only cost me 80 baht, which is about S$3.20. I am still seeking for the “Best Tom Yum Soup” in Bangkok, so i tried out luck to see if Soi Polo Fried Chicken’s can fit into my criteria. But apparently, the Spicy Pork Soup does not taste exactly like Tom Yum Soup. 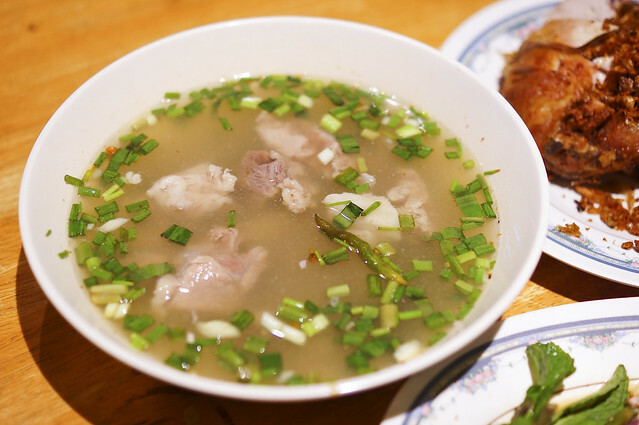 It’s just a spicy soup (not sour) with pork. Verdict? Can give this soup a miss although it only costs me S$2.50. If you are looking for a convenient eat, then I think you can skip this place. But if you are someone like me who goes overseas in search for hidden gem and good food, plot your map well and make a trip down! 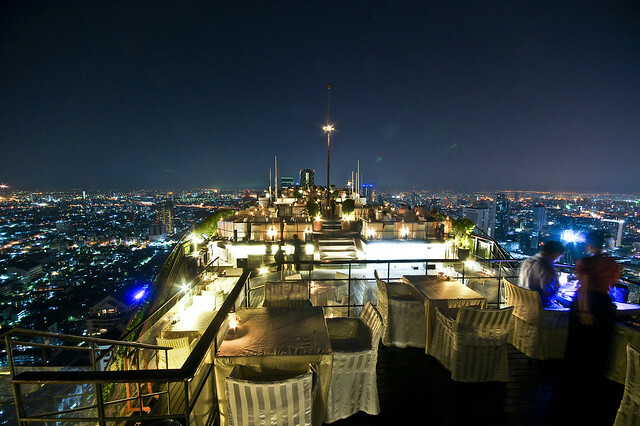 May i suggest to visit Banyan Tree’s sky bar – Vertigo & Moon Bar after Soi Polo Fried Chicken. Take a 15 minutes walk from Lumpini MRT station and i was there for my last trip. The bar itself is awesome and the night view is spectacular. One of the most romantic dining places for Lovey Dovey Couple. But do note the attire to enter the bar is smart casual. From the map provided, zoom in to the red circle “A”, you will see a street call “Sanam Khli”. The is a small lane just above Sanam Khli without any road name and that is where Soi Polo Fried Chicken is situated. I took a cab down to Soi Polo Fried Chicken although it is possible to walk from Lumpini MRT but i think it will take a 15 minutes walk from there. You will see Soi Polo Fried Chicken once you turn into the small road.